I had the gracious opportunity to attend an event at HSN (Home Shopping Network) in St Petersburg on Sunday called HSN Cooks thanks to my friend and fellow blogger, Jen (thefoodiepatootie.com). 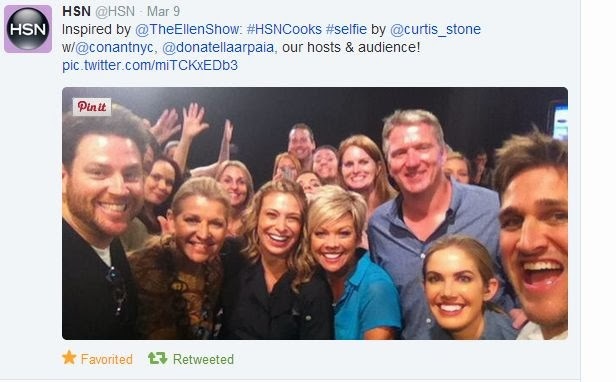 Jen was asked by HSN to be part of their 24-hour star-studded epicurean event which included top chefs and culinary experts from around the globe. If you want to be part of an event like this, there is good news - HSN's audience members are selected by being HSN credit card holders! A few names you may recognize from the event: Curtis Stone, Scott Conant, Donatella Arpaia, Kelsey Nixon, Ming Tsai, Lorena Garcia and Jessica Seinfeld! You can read about Jen's first day #HSNCooks experience here when she had a chance to interview Curtis, Donatella, Ming and Lorena. I was so excited for Jen's opportunity. When she invited me to be her plus one on Sunday for a live cooking demonstration from Curtis Stone and Donatlella Arpaia, I was beyond grateful and ecstatic. Clear the calendars! Sunday morning came and I was like a kid on Christmas, waiting patiently for this experience. I cannot believe it and have watched the clip over and over again to make sure this really happened. I did a chopping competition with Curtis Stone, he using a knife, me using his Chop Chop, a deluxe all in one food chopper and I WON!. My prize? Two hugs and a kiss on the cheek from Mr. Stone. I DIE. I have been asked multiple times if I won a Chop Chop, the answer to that is no BUT I did buy one because it was that awesome. During yesterdays event, the Chop Chop was the special of they day (marked down from $59 to $39), then saved another $10 since I got an HSN credit card. Watch out, I may be invited to future HSN Live shows! Curtis also cooked for us - fresh cut french fries (one of the main reasons I bought a Chop Chop) and apple pie. We left the show with a signed copy of his new cookbook, Curtis Stone What's For Dinner? He and Donatella had so much fun on air together and I wanted to buy everything they were promoting, including Donatella's award winning veal and shallot meatballs. When it was Donatella's turn for her on air demonstration, I sat there praying we would be trying a meatball, and we did - a meatball slider. I want another one right now just thinking about it. The meatballs come in a 5lb or 10lb frozen bag. They were INSANE. Donatella sent us off with a three pack of her Pizza Dough. Thanks Donatella! I look forward to trying out the Garlic Pizza Crust! After the live cooking demonstration was over, we had the opportunity to interview Scott Conant. I have been a huge fan of Scott's for many years. He was on #HSNCooks to promote his new cookbook, Scarpetta Cooking. Scott is an inspirational entrepreneur and all around cool dude. We sat with Scott for quite a while, learning about his journey over the years. One thing that impressed me the most was along with his 5 restaurants, Scott started SCM Culinary suite, a 3,500 square foot space in the heart of SoHo. It is a multi-functioning space, serving as a unique event space, production studio, test kitchen and his corporate headquarters. He started it to reduce the cost of expenses and turned it into a profit. He's brilliant! Following the meeting with Scott, we met Kelsey Nixon, a budding Celebrity Chef whose career I've followed for many years. Kelsey was on The Next Food Network Star in 2008 and came in 4th place. She was my favorite contestant and to this day, I believe she should have won. 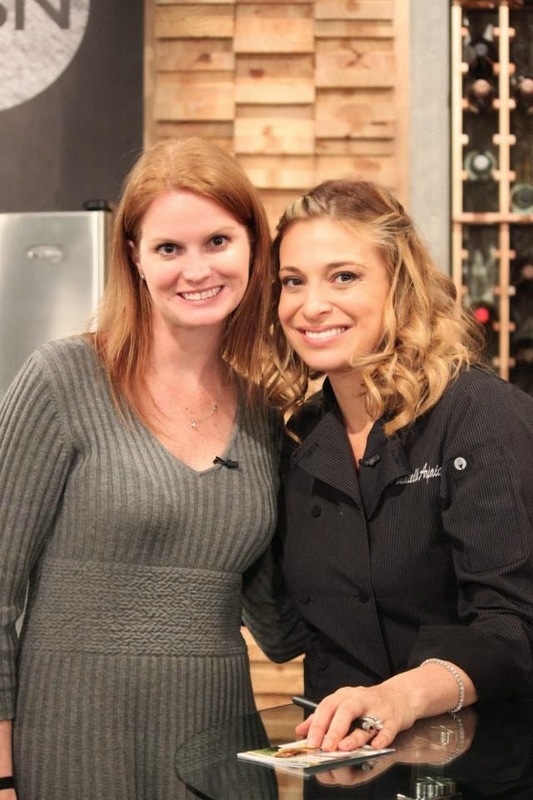 Kelsey signed on with the Cooking Channel in 2010 with the help of Bobby Flay. Kelsey is selling her newly released cookbook, Kitchen Confidence. She is beautiful inside and out and I look forward to watching her career grow. Kelsey gave advice to anyone looking to break into this career - start a youtube channel. We ended the day by chatting with Debbie Meyer, the brains behind Debbies Greenbags, Greenboxes, Cake Kut'r along with multiple other kitchen inventions. Debbie has her MBA in Marketing and lives in the area. While she couldn't give us information on the record, Debbie will have a few exciting new product releases coming out in 2014, one of which is being announced next week! What an experience! Thank you Jen for bringing me as your plus one and thank you HSN for putting on an event like this! It was above and beyond my expectations. CRAZY AWESOME...what a unbelievable day and wow ....lucky you!!! Seriously...I'm SO stinking happy for you that this happened. I LOVE your expressions on the video. So cute (and excited). I didn't know you had to audition! I'm interested in hearing what was involved...lol. That chop-chop does look pretty nifty...think I might have to buy one too. Awesome pictures and awesome re-cap on a truly awesome experience. Yay for you!